Our SEO Training course will teach you proven strategies and techniques to help you make real, lasting improvements to the quality and volume of your website visitors. The training is delivered on a 1 – 1 basis and you won’t even need to leave your desk, as the training is conducted via Skype. We’ve also recently introduced an online DIY SEO course, aptly named Fresh Bananas. Here you can work your way through my course at your own pace and in your own time. There’s a link at the bottom of the page. 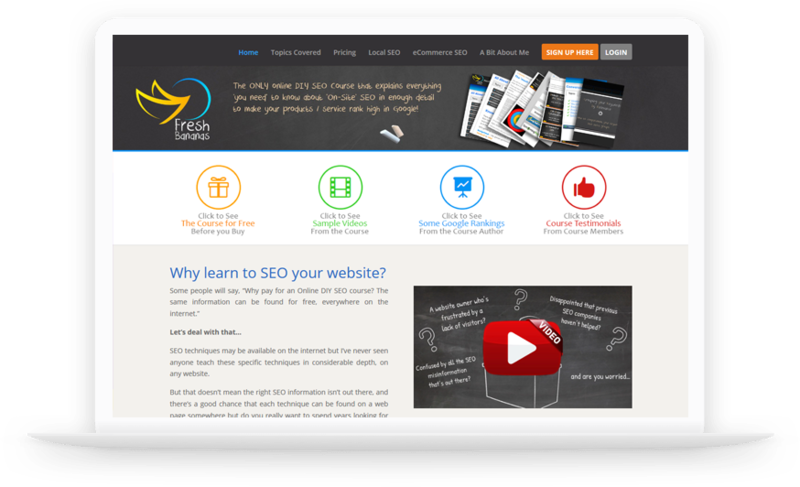 Each SEO Training course is bespoke and packed full of good, meaty seo advice. You will be coached and encouraged by our resident SEO consultant with over 16 years experience designing and optimising websites. If your business makes its income wholly or partly from the internet, it’s vital that you achieve the best possible ranking in the search engine results pages and the skills we teach you will help develop strategies to keep your website riding high for a long time to come. • Set aside 2 days without disruption to focus on the SEO training. • Have Skype (free download available here) installed and working on the computer you intend to use for the training. Buying a headset & mike will allow you to be ‘hands free’ during the training which you’ll find very helpful. Headset/mike sets can be purchased from many retail outlets for as little as £3.00. • Be able to access the Internet throughout the duration of the course. • Have a large notepad and pen handy. After you have completed the SEO training course and implemented the techniques you have learned on your course, we will spend a further (at no cost to you) half day together, evaluating your work to ensure that you’re on the right track. Support is available even after you’ve finished your course. This course is aimed at helping online businesses to make the most of the internet as an advertising medium, it is not designed to teach you how to offer professional seo services. It is however, designed to teach you how to seo your own site both effectively and affordably! Get in touch with us now for an informative chat by ringing 01568 782331 now, or fill in the form below. It’s really that simple! We’ll happily, if required, provide proof of current page 1 rankings and contact telephone numbers so you can check our seo abilities directly with our clients. We can’t be any more honest than that, now can we!